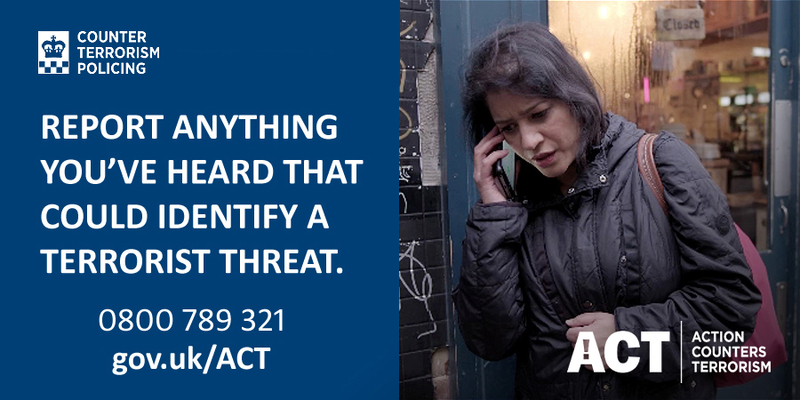 Police are calling on the public to share information with their friends and family about how they can help counter terrorism – and potentially ACT to save lives. Following a number of recent incidents, police are keen to remind local communities that terrorists can strike anywhere and everyone across the UK should remain alert but not alarmed. If you have suspicions – just ACT. All the details can be seen via this link gov.uk/ACT – which officers want people to share. The site includes videos – watched by nearly one million people so far – along with posters and two podcasts which tell real life stories about how the public helped foil terror attacks. Since launching the initiative in March, 3000 people have contacted police with information. The vast majority of concerns turned out to be nothing, but a small number contributed significant information that police have followed up on – information that might otherwise have been missed. Detective Chief Superintendent Russ Jackson from North West Counter Terrorism Policing: “Information from the public is vital to stopping atrocities. The police and security services are working hard to tackle the threat but we can’t do it alone. “We are working with lots of different agencies and businesses who are all able to contribute to keeping our communities safe – but we need the public more than ever. “We understand that people might hesitate to contact us because they are worried it could be wasting police time. In most cases it will be nothing to be concerned about but we would rather you called than risk us missing some vital piece of information. All information received will be treated in confidence.